The Survey feature of Concep Send for Microsoft Dynamics CRM enables you and your team to create various types of forms and have them completely integrated with your CRM. This integration is only possible by using the mapping fields function. In this article, you can learn more about this function, its benefits and when to use it. Why should I use mapping in my Survey? Whenever you map a Survey, the integration connector receives this information and uses it to populate your Microsoft Dynamics CRM with the Survey data and its responses. There are 3 types of mapping field options: ‘Survey Type’, ‘Campaign’ and ‘Question’. The Survey Type field mapping can be found in the Survey editing page. This drop down field is only displayed when the ‘Track Submissions’ box is ticked. The options are loaded from the Survey Type in the Submission entity of your Microsoft Dynamics CRM. The selected option will be captured by the integration connector, which will use it to create and update the Submission in your Microsoft Dynamics CRM. The Survey Type data can be particularly useful for reporting purposes, as it enables users to compare the performance of different types of Surveys. The Campaign mapping field can be found in the Survey editing page, right below the Survey Type field. As with the Survey Type’ field, it has a drop down menu, which can be seen once the ‘Track Submissions’ box is ticked. 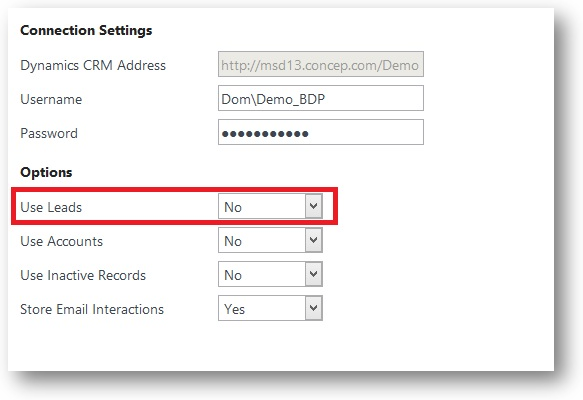 The Concep Send application uses your user permissions to fetch the Campaigns from your Microsoft Dynamics CRM; only the Campaigns visible to your user will be listed in the drop down menu. The integration connector will link your Survey to the mapped Campaign when creating or updating it. Thus, the Survey will be part of the Campaign and available in the Submission section of the Campaign. The Campaign mapping allows users to have all of their Surveys organised under Campaigns, making it easier to find any Survey related to a specific Campaign. It also enables the ‘Campaign Response’ field mapping (see “Question Mapping” below for more information). The Question mapping field can be found inside the Survey question and is only visible when the ‘Track Submissions’ box is ticked. It has a drop down menu comprised of the Contact and Campaign Responses fields from your Microsoft Dynamics CRM (please see the below field types). 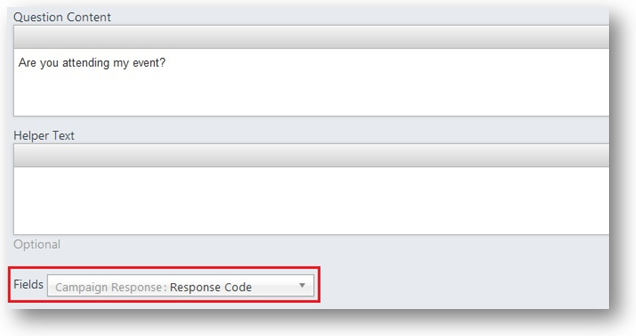 The mapping created for your Survey questions will be used by the integration connector to update the Contact and/or Campaign Response mapped fields. The Campaign Response will only become available once your Survey is mapped to a Campaign. To prevent the Survey responses from creating duplicate Contacts and Campaign Responses, the integration connector has a duplicates check routine. For Contacts, the integration connector looks for Contacts which contain the same e-mail address as provided in the response. If it finds the Contact, it will update its fields using the Question mappings. If it doesn’t find the Contact (or Lead), it will then create a new Contact (or Lead), also using the Question mappings. For the Campaign Response, the integration connector looks for Campaign Responses which are under the same Campaign and linked to the same Contact it is trying to create. If it finds a Campaign Response, it updates this with the new data. If it doesn’t find one, it will create a new Campaign Response. In the Integration tab in the Send Admin area, the CRM administrator can enable the integration connector to use Leads. For Surveys, this means that if the duplicate check routine doesn’t find a Contact with the e-mail provided in the Survey response, then it will look for a Lead with the same e-mail address. If it finds a Lead with the same e-mail address, it will update it using the question mappings. If it doesn’t find any matching record, it will create a new Lead, also using the question mappings. Your respondent responses are logged in their activity history. Your event registration list is automatically updated with your invitees’ responses to your invite. New Leads and/or Contacts are automatically created in your CRM, enabling the Business Development team to follow up on any new opportunities.